Spring break is on the horizon for many of us. If you're heading someplace warm & beach-y, your cocktails and gelato shouldn't be too hard to track down. But if you're like us and sticking around the East Coast, I've got some great ideas coming up for you. 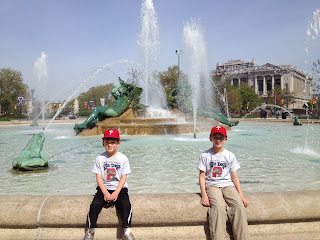 Philadelphia was our spring break destination last year and again during Christmas vacation this past December. Just over 2 hours from NY (depending on the unpredictable GW Bridge & NJ turnpike traffic) Philly is a city full of history, great restaurants, fun cocktails, fabulous art, and plenty of kid friendly activities to keep everyone happy. Reading Terminal Market is centrally located and a great spot to start your day. It's a definite must for sightseeing, and a bonus that you can combine it with breakfast or lunch. The country's oldest indoor farmers market and food hall dates back to the late 1800s, with many stalls still run by the Amish of Lancaster County. We ate breakfast there almost every morning and I don't think we ever got the same thing twice. I still dream about the scrambled eggs and cheese wrapped up in a pretzel. The boys loved walking around checking out the different food stalls, the strange things at the fish counters, and the endless selections of candies, cupcakes, pies and pretzels. There is plenty of seating in the center of the market, and the parade of people walking by will provide lots of entertainment. Or if the weather is good take your food to go and head outdoors to one of the many nearby parks. 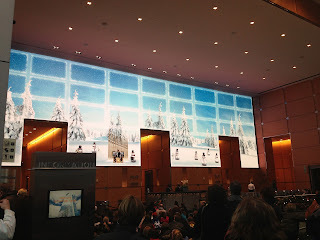 The Comcast Experience "Snowman Symphony"
The Comcast Center is another great destination for combining a bit of culture and sightseeing with breakfast or lunch. The tallest building in Philly houses a great food court in the basement, along with the Comcast Experience show on giant LED screens in the lobby. If you walk in and see nothing but paneled wood walls, grab a seat and wait for the show to start. The high definition screens morph into a fabulous music and special effects show (don't tell your kids ahead of time, they'll enjoy being surprised) several times a day. Di Bruno's Italian market in the basement of the Comcast Center is our favorite spot to grab a quick lunch. They have several locations around Philly (the biggest and best is in Rittenhouse Square) and they're famous for their gourmet food, and cheese and meat departments. We bought paninis while the boys ordered slices of pizza from the next stall over. The tables are usually filled with office workers grabbing a quick lunch, so if it's too crowded take your stuff to go and head to nearby Logan Square for a picnic next to the Swann Memorial fountain. The Square is across from the Franklin Institute, one of the oldest science museums in the country. 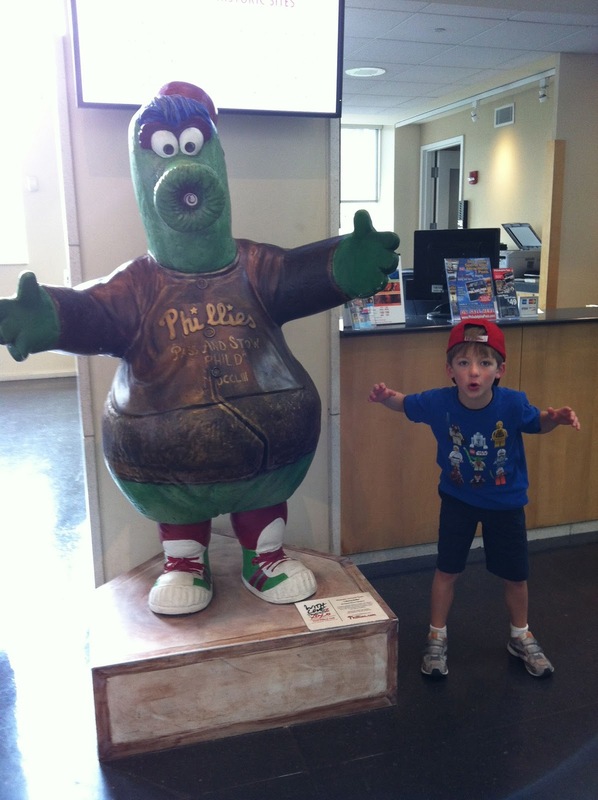 We usually stop by the Comcast Center to have some lunch on our way to the Franklin Institute. I made a totally rookie mistake in December when we were caught in the Franklin at lunchtime (breakfast at the Reading Terminal Market didn't last us as long as I thought) with cranky kids (and adults) and a super long line to get back into the museum. 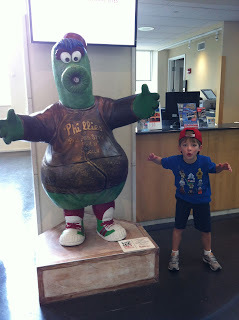 Instead of venturing out, we headed to the museums' Franklin Foodworks cafeteria for some very lousy food. The tables were jam packed with other cranky families and nobody was happy. But it was lunchtime, at a huge museum, during holiday break, so some unhappiness was expected. The better plan would have been to stretch out the morning working our way towards the Franklin Institute, stopping for lunch at the Comcast Center (or the nearby Corner Bakery Café) then heading to the museum. 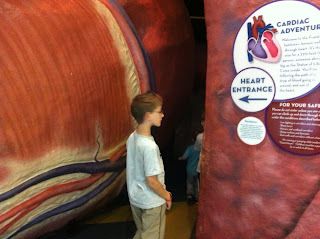 We rarely spend all day in one museum, but the Franklin Institute had enough to keep the little C&Gs entertained for hours. There are 3 floors of hands on activities, a planetarium running free shows all day, and a giant gift shop filled with science books and toys for all ages. Our post-lunch second wind carried us all through till cocktail hour, so stay tuned for tomorrows post on the kid friendly cocktail bars of Philly. The Comcast Center is free, as is the Reading Terminal Market. Buy your tickets online for the Franklin Institute to avoid the lines, general admission is $16.50 for adults and $12.50 for kids. Your ticket comes with 1 free planetarium show, IMAX and Franklin Theater shows are extra.